In the southern Kalahari rain falls predominantly in summer but is highly unpredictable in terms of pattern, distribution and amount. This is well documented by the following Figure which compares the rainfall pattern in December for two consecutive years. Rainfall of less than 5 mm will not be biologically active and has little impact on the vegetation unless it follows an abundant rain. Figure 1: Distribution and amount of daily rainfall in December 1998 and December 1999 at the farm Avontuur. Distribution and total amount differ significantly. The annual amount of rainfall varies also from year to year. Years with good rainfall can be followed by years with insufficient rain. Sometimes there is a couple of drier years in sequence as happened in the early nineties of the last century. More important than the total amount is the distribution of rain or the rainfall pattern. The more evenly rain is scattered over the rainy season the more the vegetation will benefit from it. Figure 2: Distribution and amount of monthly rainfall in two conse­cutive years at the farm Caledonia. The total amount of rain in 1989/90 is about one third that of the previous year. 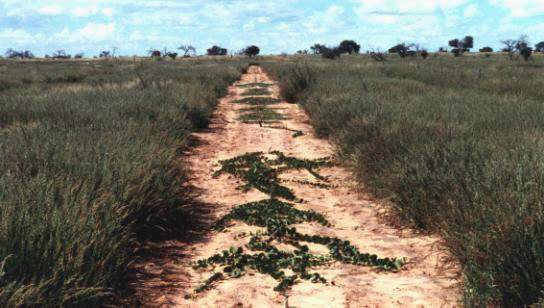 The southern Kalahari is a semi-arid area with a hot summer and a cool and dry winter. On the flat and sandy plains of the Kalahari even heavy rain will seep into the ground. There is very little run off. However, due to the high temperatures and the high solar radiation loss of water from the soil (evaporation) and loss of water from the vegetation (transpiration) is much higher than the water income by rain. Consequently, the water budget of the Kalahari is negative unless evaporation is demished artificially. The negative water budget is responsible for the semi-arid character of the Kalahari. The following sketch shows in a simplified way the water and water vapour fluxes that lead to the negative water budget. Figure 3: Sketch of the water fluxes in a semi-arid area where evaporation and transpiration exceed rain. The thickness of the arrows represents the amount of water gain (rain) and water loss (evaporation and transpiration). Can water be withheld from evaporation? by destroying the capillary system in the top layer of the soil shortly after each rain. This procedure leads to a disconnection of the water path through the capillary system. Consequently, capillary rise of water will not reach the surface and evapora­tion will be reduced substantially. Figure 4: Sketch of the water fluxes in a semi-arid area where water loss due to evaporation and transpiration has been reduced by removing the vegetation and destroying the capillary system in the top layer of the soil (right part of the sketch). The thickness of the arrows represents the water fluxes. 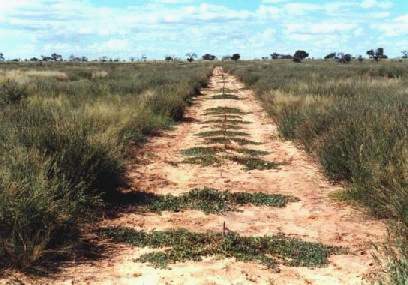 Due to high erosion of the soil caused by the prevailing strong wind no vast areas should be deprived of its vegetation. is to alternate vegetated with vegetation free stripes. 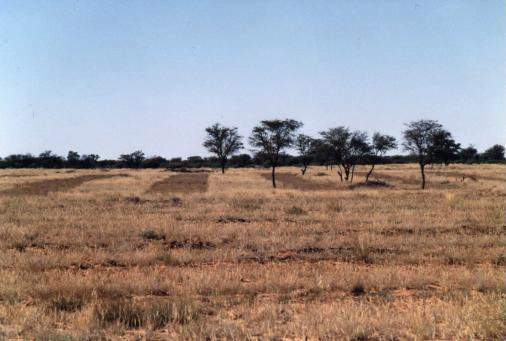 Figure 5: The photo shows how vegetated and vegetation free stripes are arranged in the field. The vegetated stripes are 7 m the vegetation free stripes are 5 m broad. Every 200 m the direction of the stripes is changed by 90° to dimishes wind caused erosion. Is there really more water available in the vegetation free stripes? Figure 6:Trime-sensors monitoring the soil water content are placed in undisturbed soil at various depths as given in the Figure. Two rows of sensors are installed, one in the vegetation free stripe and one in the vegetated stripe (given by the horizontal green bar). Every ten minutes the signals of the Trime-sensors and of the thermometers are stored by a data logging system. The necessary energy is provided by a solar panel. After an equilibration time of 14 hours the continuous measurement was started. Evaluation of the data recorded thereafter revealed little to nil change of the signals over a period of 2 hours. The obtained and processed signals are presented in Figure 7. 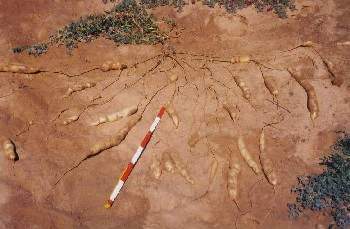 It can be seen from this Figure that there is substantially more moisture in the soil of the vegetation free stripe. Figure 7: Soil water content in % dry soil as measured by the Trime-sensors placed in the vegetation free and vegetated stripe as shown in Figure 6. Spot measurement after mounting the whole set of sensors and equilibration over night is presented in the graph. 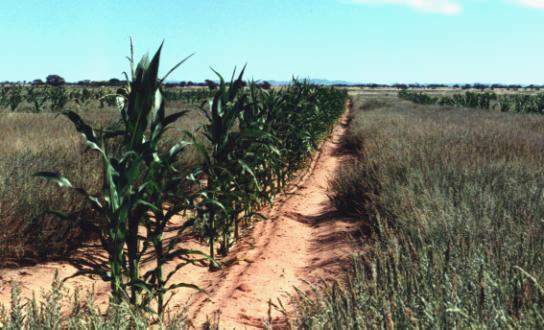 Figure 8: Maize growing in the Kalahari without irrigation in stripes in which the original vegetation has been removed and where after each rain the top layer of the soil was worked through mechani­cally to destroy its capillary system. Figure 9: Marama beans (tomani) planted to the vegetation free stripes are growing vigorously in the vegetation free stripes. 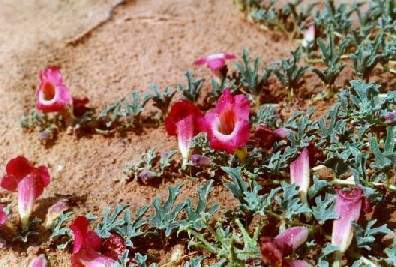 Figure 10: Devil’s claw planted to the vegetation free stripes grows also much better here than in the sometimes dense grass. 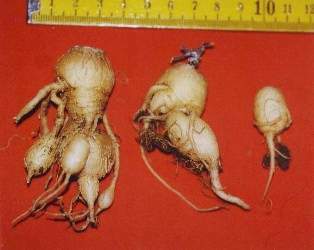 Figure 12: Devil’s claw cultivated from three months old primary tubers which were raised in Germany from seed and then trans­planted to the Kalahari (a) size when planted to the Kalahari, (b) size after 18 months of cultivation in the vegetation free stripes.